I do not mean to trivialize our King or the redemption he purchased with his own blood. But if you’ll permit me, I would like to draw an analogy. In the movie, A Knights Tale, William Thatcher is found not to be of noble birth. In fact, he is the simple son of a simple peasant. On a night when it was clear that we were not worth saving, the Son of the King leaned in. On a night when everyone abandoned him, the Son of the King leaned in. On a day when he could have called 10,000 angels the Son of the King leaned in. When he could have come down from the cross and saved himself, the Son of the King leaned in. In the movie, the son of the King stands and pronounces to the crowd that William is nobility. His word is the final word and as such is “beyond contestation.” William is made noble by the actions of the son of the King. The same thing happened to us. We were born into a sinful world. We had no righteousness of our own. We had no right to claim anything but the rightful consequences of our sinful lives. Yet the Son of the King stooped down, lifted us up and declared us to be nobility. "Yet to all who received him, to those who believed in his name, he gave the right to become children of God" John 1:12. I think one of the most moving scenes from the movie, The Passion is when Christ is carrying the cross and he seems to be embracing it, not so he can carry it, but in adoration of it. He loved saving us! That is leaning in. 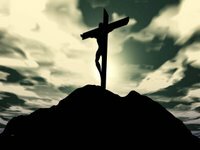 There is no nobility on Earth like that of Jesus Christ on Good Friday. He truly has the Noblest Heart.